Scallops might just be one of my favorite “fancy” things to make and eat. It’s kind of like putting on a cute dress…it looks like you spent a lot of time getting yourself together for the day, but really it was almost effortless. Sneaky…I know! Anyway, scallops may seem a little scary or daunting, but they don’t take a lot of seasoning or extra work. Just keep it simple and you’ll be happy every time. For this dish, we had leftover lemon artichoke pesto sauce in the fridge so it was very quick and made a weeknight dinner stress free. Baking the spaghetti squash was the most time-consuming part, so imagine if you had the squash leftovers as well, this would be the ultimate weeknight meal. 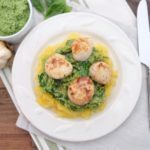 When the squash is almost done, remove from the oven and let cool while you heat your pesto sauce and sear your scallops. 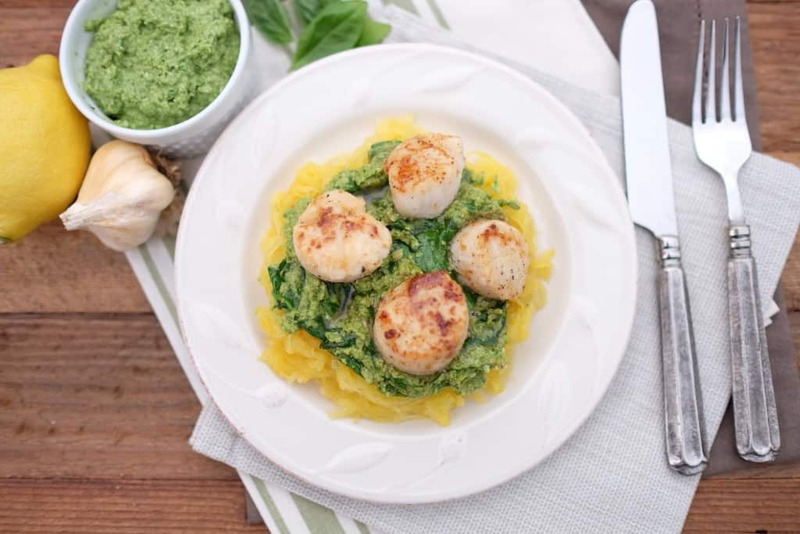 Scoop spaghetti squash on your plate, then layer the pesto sauce and scallops on top. Eat up! What else pairs well with this recipe besides spaghetti squash? I have zucchini but usually I need to mask the taste of that and was wondering if scallops and pesto would be enough? I’m stuck in the house during a snow storm. I got left over pesto and some frozen scallops. Just need something to serve with it that’s just as healthy, regular spaghetti would be my last choice. :). You could definitely try zucchini noodles! Try mixing up the pesto with the zucchini noodles in a pan and just cook long enough to let them heat up. The zucchini will take on the taste of the pesto, and then just add the scallops on top. Let us know how it turns out! Also, stay warm and good luck getting through the snow storm.